The context: Warfare conditions at home and abroad were unfortunately ripe for pandemic disease. In the spring of 1918, a deadly strain of influenza began exploiting the crowded camps, public gatherings and mass movements created by global war. The disease struck in three waves: spring and summer of 1918, the fall of 1918 and spring of 1919. Outbreaks occurred across the US, Canada, South America, Europe, Asia and Africa. In its wake, the pandemic would leave at least fifty million dead across the world. Baltimore was hit hardest in the second wave. Between September 26 and the time McLean wrote this letter, influenza morphed from a few reported cases in Camp Meade into a city-wide epidemic. The epidemic would not fade until late November. By then, at least 75,000 of the city's 733,826 residents had contracted influenza. 4,125 were reported dead of the disease. The context: By mid October, Baltimore’s hospitals were full to capacity with influenza victims and could accept no new patients. 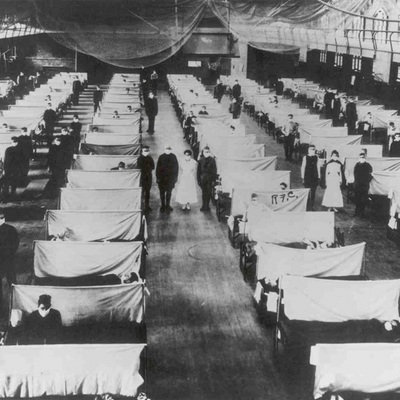 At Johns Hopkins Hospital, influenza patients occupied six full wards. Medical institutions throughout town were doubly strained due to the loss of doctors and nurses to the war. Medical students at Hopkins were called upon to help in several regional hospitals, including Johns Hopkins Hospital and Camp Meade. Some, like McLean, even took over a few of their mentors’ other clinical duties. The context: Early on, Baltimore’s officials were reluctant to take any action beyond issuing cautions. Up until the autumn of 1918, influenza had not officially been a reportable disease. While the health department admitted in late September that influenza seemed to be increasing in the city, officials had difficulty estimating the actual numbers. Health Commissioner Dr. John Blake decided that the outbreak would quickly peak. “Drastic measures" would cause unnecessary panic and lower people's resistance to disease. By mid-October, it had become clear that the problem was only worsening – not climaxing. Baltimore city officials moved from issuing warnings to sterner measures, like the ones McLean mentioned in this letter. The measures came too late. “The flu is pretty bad over here, over seven hundred deaths in Baltimore last week…Three medical students at Hopkins have died also three nurses and two doctors. One of them was just at the apex of his training, having spent seven years in the hospital as an interne in surgery. He was about to go into practice as an expert after his last year in the hospital. He lived with his mother in an apartment near the hospital. I do not know if she is left alone, but she must feel terribly sad. Dr. Howell’s son-in-law is critically ill…Dr. Hamman’s three children are in the hospital with it and also Theresa Sharrette, his wife’s sister. The context: The flu epidemic was a shocking experience. 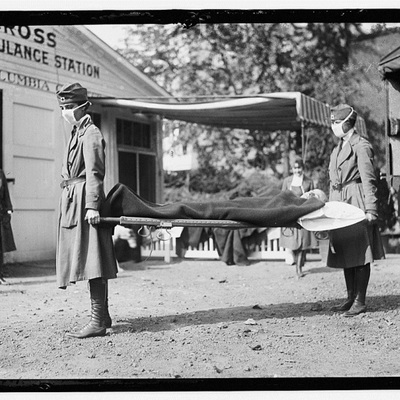 People in 1918 had been used to influenza, but the flu they had known resulted in no more than 5 deaths in a given season. Those deaths were almost always among the very young, the frail or the elderly. This strain of flu was frightening by comparison – even for the most seasoned personnel at Hopkins. It was lethal to a much wider range of people, from the frail and elderly to healthy medical students and nurses in the prime of their lives. At the Johns Hopkins Hospital, three staff physicians, three medical students and six nurses died during the epidemic. Staff and students also witnessed bouts of sickness and even deaths in their families at home. Along with news of cases, reports of shocking symptoms circulated: victims becoming delirious, turning blue in the face, coughing up blood and frothing at the mouth. It is no wonder that McLean’s letters home began to fill with anxious inquiries about the wellbeing of his family. In the end, he and his mother did manage to escape the flu, but not the flu’s societal impact.